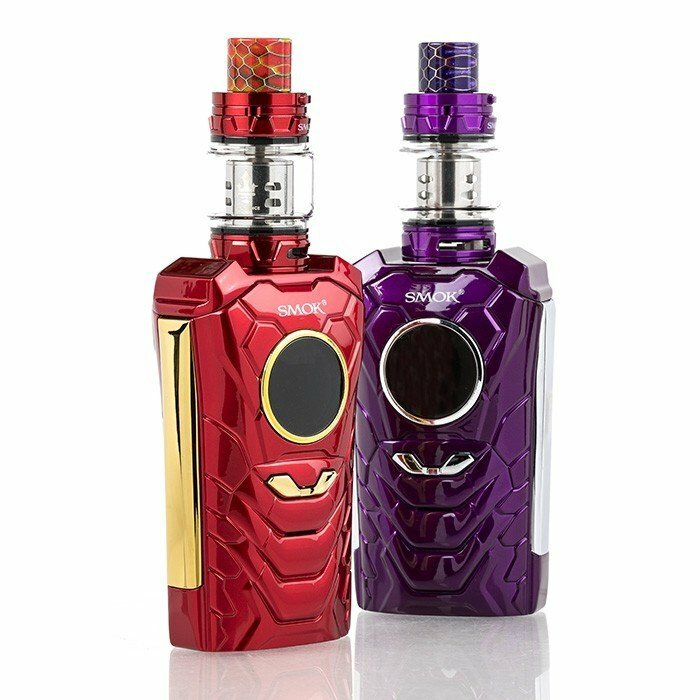 For the last few months both iJoy and SMOK were in a race to put out their version of an A.I. Mod, and as we now know, iJoy beat SMOK to market with their modestly-received iJoy Avenger (reviewed here). SMOK took a bit longer, but a couple of week ago the SMOK I-PRIV Kit was released. So far, it seems the I-PRIV is selling a bit better than the Avenger. You should know that the Avenger has dropped in price as well. The central core of both the Avenger by iJoy and the I-PRIV by SMOK is that when told to change the wattage, or color of the light, and other such things, it does so. But, do we need, or want this kind of gimmick. And talking about gimmicks; both devices were “inspired” by Superhero’s. Seriously. Since this reviewer finds voice commands for a vape mod to be completely unnecessary, I’ve decided to review the SMOK I-PRIV as if it didn’t have voice commands. 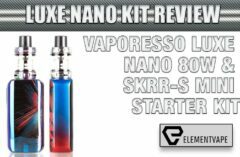 Instead, I’m going to include a video by Element Vape that shows off the voice commands of the I-PRIV, and you can decide if you would actually use this method to change certain, limited adjustments to your I-PRIV Mod. For a list of Voice Control commands and tutorials when using the SMOK I-PRIV, please see the YouTube video below. 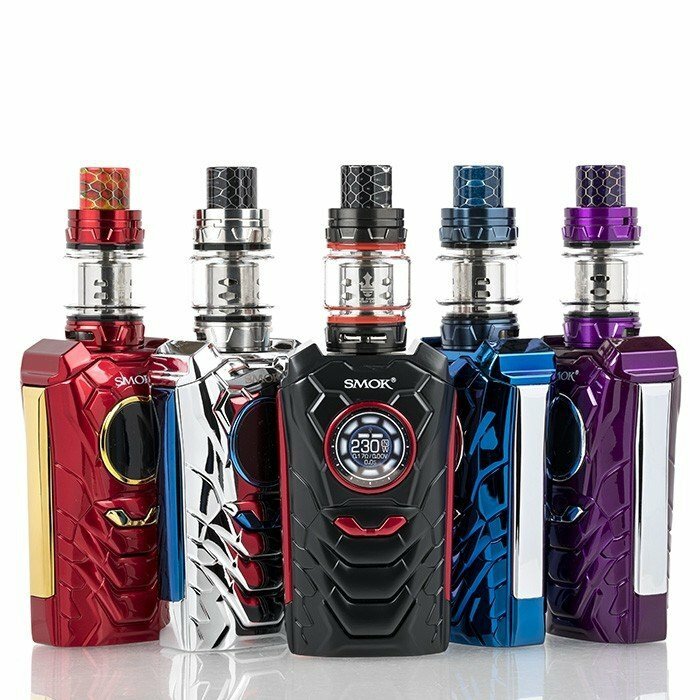 The SMOK I-PRIV 230W TC Starter Kit is equipped with an excellent chipset and compatible with Dual 18650, Dual 20700 and Dual 21700 cells. The Starter Kit also includes a full-size TFV12 Prince Tank (reviewed here). I’m sure that when it comes time to do a small upgrade to the SMOK Devilkin (reviewed here) and I-PRIV, the newer TFV12 Prince Cobra (reviewed here) will be the included Sub-Ohm Tank. But for now, at least it’s the full-size TFV12 Prince, not the reviewed here or Big Baby Prince. 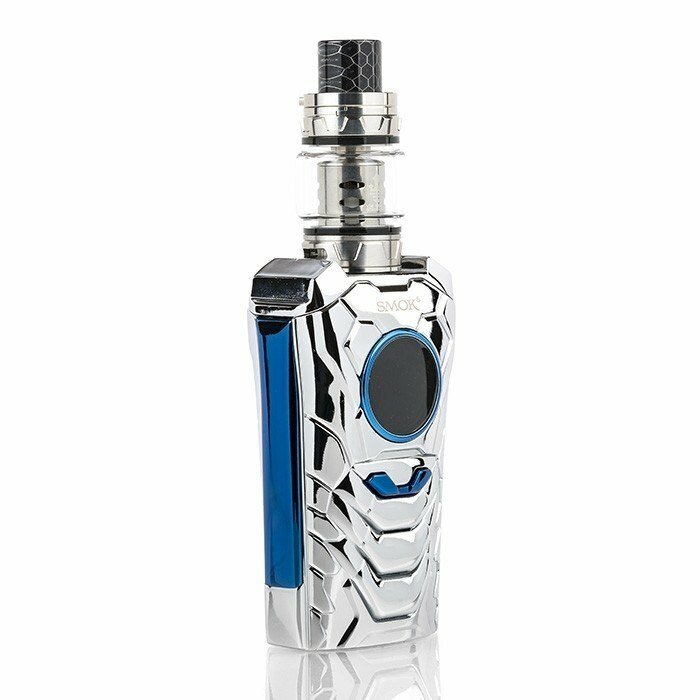 This time out, SMOK’s decision to make the I-PRIV compatible with 2X700 cells, it’s done for “vape life”, not power boosting. Should the user wish to use the dual-18650 sleeve, the I-PRIV will output the same 230W. If you already have several (at least 4) 2X700 cells, you’ll get an extra hour of vape time using them instead of the 18650’s. SMOK doesn’t include any batteries in this kit, so when it came to test the I-PRIV with the larger batteries I chose two Aspire 4000mAh 21700 cells, which gave me a full hour more than two 3100mAh Nitecore batteries. 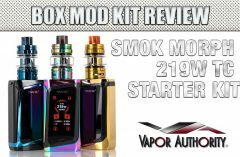 The SMOK I-PRIV 230W Box Mod implements the Voice Control System as well as the iJoy Avenger does, and I might even give the nod to SMOK for a couple of snarky comments the I-PRIV can make, such as when you tell it to turn itself off. Additionally, the I-PRIV Box Mod offers an abundance of modes, including variable wattage, temperature control, as well as a circular color display and memory modes. The SMOK I-PRIV offers a full 1W-230W wattage range, a minimum of 0.06-ohm, and a voltage range of 0.5V to 9.5V, pretty impressive for any mod. 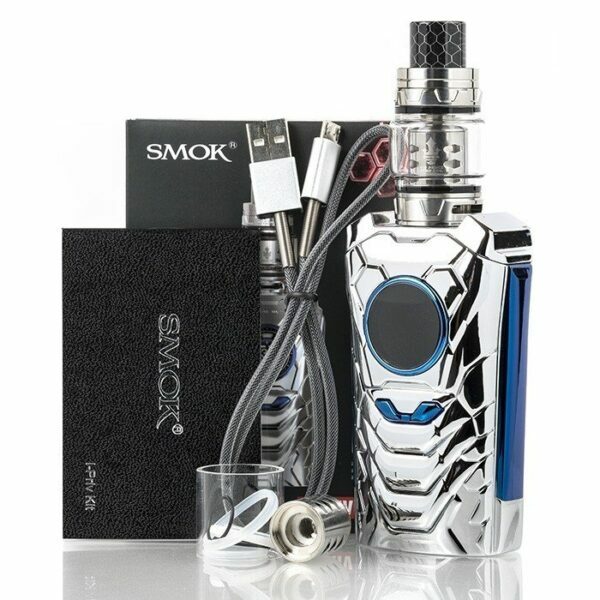 Like most other SMOK devices the I-PRIV has a side fire panel, magnetized full back battery door, and a MicroUSB port for firmware upgrades. Firmware upgrades could potentially improve and expand the voice commands, so I see some potential for users that actually want to control their I-PRIV by voice. A perfect example for a huge improvement that “might” be able to be achieved through a firmware upgrade would be to allow the user to say something like “Increase Wattage by X amount” instead of repeating “increase wattage” over and over again until it gradually gets to where the user wants it. Talk about tedious. Naturally there are many other specs and features, which you can look over here in the review. The SMOK I-PRIV Mod and Prince tank is “hefty” without batteries. When batteries are added the weight goes up, and it will be noticeable. However, even with a pair of 21700 cells it isn’t too heavy by any means. Despite the aggressive design elements that remind me of “body armor”, the I-PRIV is comfortable to hold, and easy to fire. As you can see in the videos and the photos that accompany this review, its shape lends itself to a solid grip. The Spinfuel VAPE Sub-Ohm Tank of the Year, the SMOK TFV12 Prince Sub-Ohm Tank has a maximum capacity of 8mL, plus the new button-lock hinged top-fill method, sublime dual bottom airflow slots, and of course the wide-array of the TFV12 Prince Coil System. Included with this Starter Kit is the 0.15ohm V12 Prince Strip Coil – rated for 40-100W, and a 0.15ohm V12 Prince Mesh Coil – rated for 40-80W, recently introduced with the Prince Cobra Sub-Ohm. Both the Strip Core and Mesh Coil are excellent choices for this Kit, but if you have a favorite Prince Coil you can certainly use them with this Prince and the I-PRIV mod. 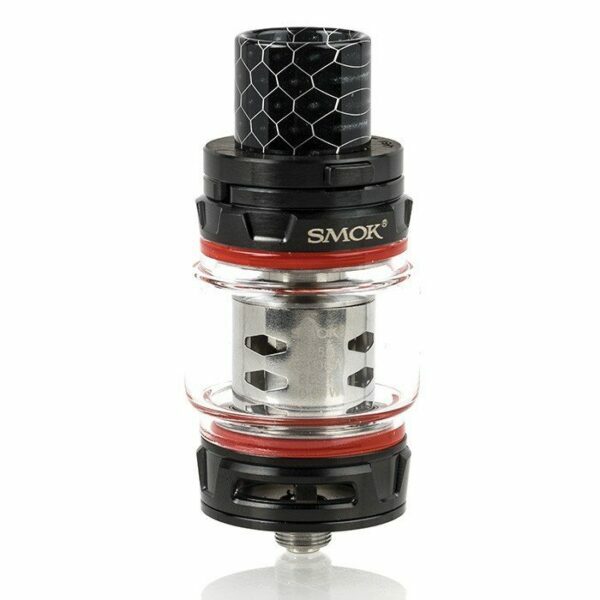 I’ll admit that I’m a bit confused as to why SMOK chose these two coils to include when the maximum output of the mod is 230W. One of the Coils should have a higher wattage rating, like the V12 Prince-T10 Decuple Coil rated up to 110W, or perhaps even the SMOK Prince RBA. The two included coils perform exactly as they do with the Prince Cobra, no surprise there. During the review period I switched out the Prince with the X6 and Q4 coils with exemplary results, and also vaped the I-PRIV with the Prince Cobra Sub-Ohm with excellent results. 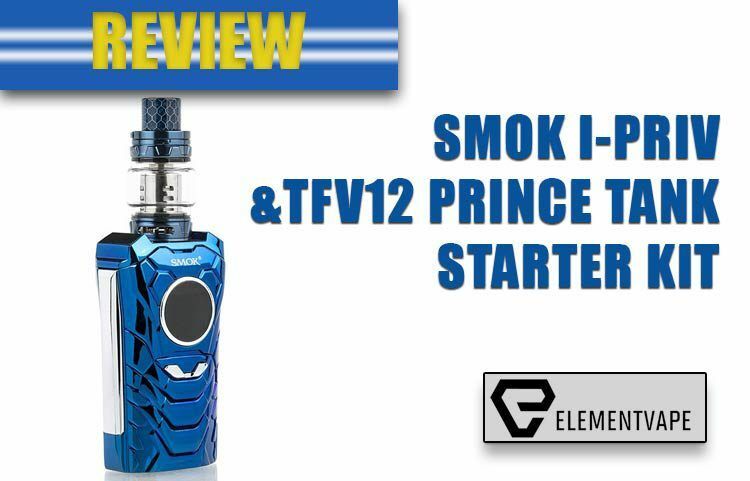 To learn more about the TFV12 Prince, read our in-depth review. Even if you discount the voice commands (which I’m betting with get old fast), the SMOK I-PRIV Starter Kit is an excellent vape kit. I like that the mod and tank are color matched, the price is in line with other high-wattage SMOK Mods, and the easy to read, sharp, circular OLED display that sits in the upper portion of the front of the Mod is crystal clear with all the information shown in an intuitive fashion… all in all, the I-PRIV Kit is a good value. 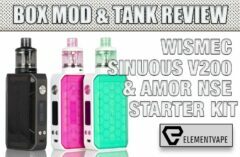 When you pop over to Element Vape to pick up your SMOK I-PRIV Starter Kit, know that should you decide to never bother with the voice commands, that the multiple battery platforms, the overall aesthetics, and the comfortable grip and superior vape experience with the TFV12 Prince, you won’t suffer Buyer’s Remorse. The Voice Activation is basically nonsense, but everything else makes the I-PRIV Starter Kit a tough to pass up bargain.